Because of the excellent material quality and processing, our samplers are extremely durable. That pays off for you! Now, the purchase of the proven GIMAT samplers is even more attractive: We have extended the warranty on rusting of the housing to 20 years! Such a promise of quality is unique and only available from GIMAT! The samplers FS / FSV according to ISO 5667 are specially designed for automatic sampling of surface waters and waste water. 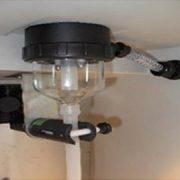 They have all the functions that are necessary for fully automatic sampling. They have been specially optimized for longevity and lasting reliability. The modern control system allows time, quantity and event proportional sampling and time preselection. Because of the robust stainless steel housing, the units are predestined for outdoor installation in a wide variety of climatic conditions. 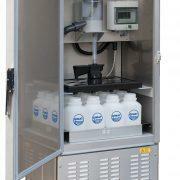 Optionally as a sample with a bulk sample or with a distributor for 12 bottles. Intelligent software from GIMAT, paired with state-of-the-art hardware from SIEMENS, results in maximum ease of use and reliability. Simple menu settings in plain text make complicated, user-unfriendly menu structures a thing of the past. This also applies to status and error messages, so that you know what you are at a glance. In normal operation, everything is even easier: To start a sampling cycle, a single push of a button is enough! The most common cause of equipment failure is in the pinch valves. That is now past. Simple visual inspection makes sure everything is OK. If necessary, simply change the hose. Very cost-effective, and in no time, your GIMAT sampler is ready for use again. The sample is sucked in via a vacuum generated by a compressor. 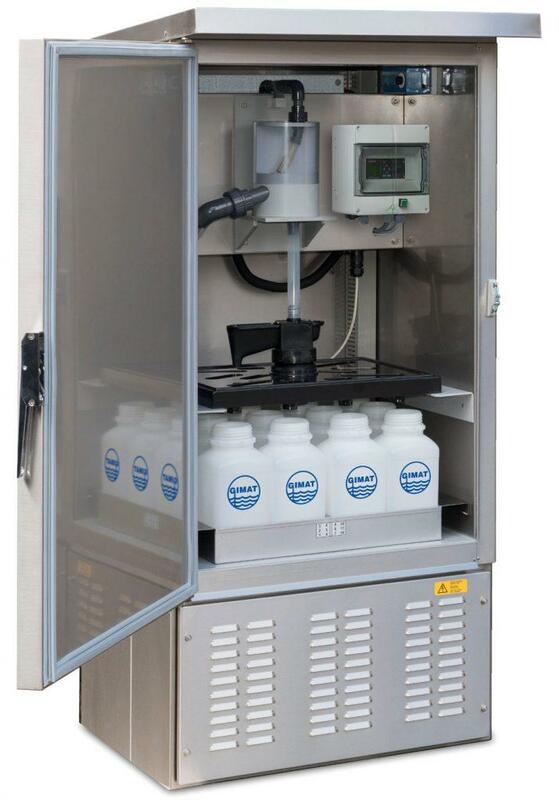 The samples are then filled into a 20 liter mixed sample container (type FSV 20/1) or by means of a rotary distributor into 12 bottles (FSV 2/12). 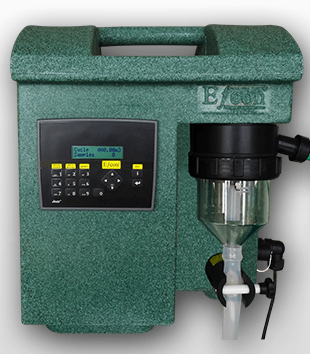 The Efcon family of automatic samplers to ISO 5667, in a robust, double-walled plastic housing, are flexibly configurable, reliable and economical partners for all applications. The modern control unit Jazz allows time, quantity and event proportional sampling and time preselection. With this device, we offer a low-cost alternative to samplers in stainless steel. 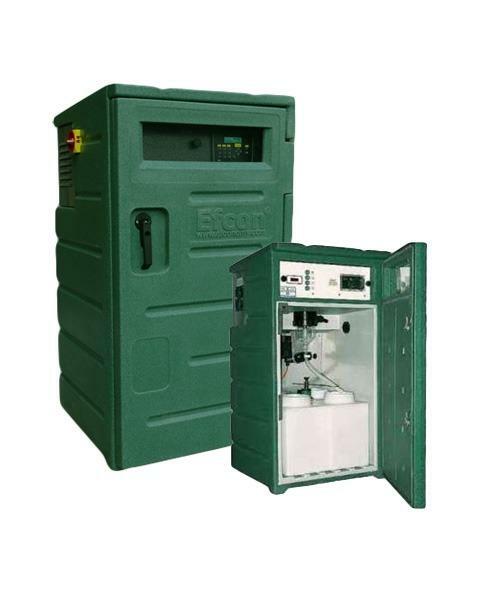 In addition, we grant a 5-year warranty on the robust, patented thermoplastic housing. The plastic housing has a 40 to 60 mm thick insulation made of PUR foam all around. 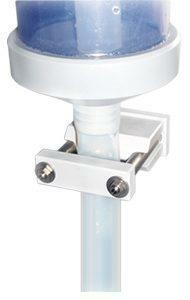 This ensures reliable and energy-efficient cooling of your water sample. The operation of the Efcon sampler is super easy. With menu structures and status messages in plain text you know what you are at a glance. The most common cause of equipment failure is with vacuum samplers in the pinch valves. That is now past. Simple visual inspection makes sure everything is OK. If necessary, simply change the hose. The sampler is ready for operation again at low cost and in no time at all. The sample is sucked in via a vacuum generated by a compressor. The samples are then filled into a 20-liter mixed sample container or by means of a rotary distributor in 12 or 24 bottles. 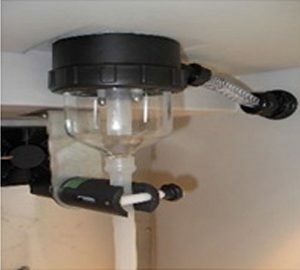 Maximum suction height is 7 m. For higher suction heights, the sampling takes place by means of a vacuum pump via a peristaltic pump. 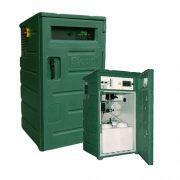 Also available with peristaltic pump, pusher and ILS systems. Your GIMAT account manager will advise you on these solutions for pipes, pressure, higher temperatures or sludge. 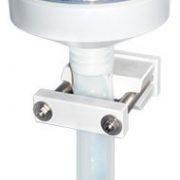 Sampler for wall mounting with sturdy thermoplastic housing according to ISO 5667. Easy to transport – ideal for use as portable sampler together with the separately available rack. The economic solution when no temperature-controlled cabinet for the samples is needed or if sampling is only required temporary. The modern controller Jazz with LCD display allows time, flow and event proportional sampling.